With the passing of World Food Day last month, the UN reminded us that “efficient, well-managed and sustainable food systems are essential to end hunger and malnutrition as well as protect the environment.” The occasion has been an annual reminder of world hunger and agriculture issues since its inception in 1981. Despite the best efforts of Norman Borlaug — the father of the Green Revolution in food production — food and global population still present a scary numbers game, though potential remains for increased production without relying on further scientific breakthroughs. In sub-Saharan Africa, where corn yields per acre are ten times lower than those in the US, one glaring deficiency is fertilizer use. 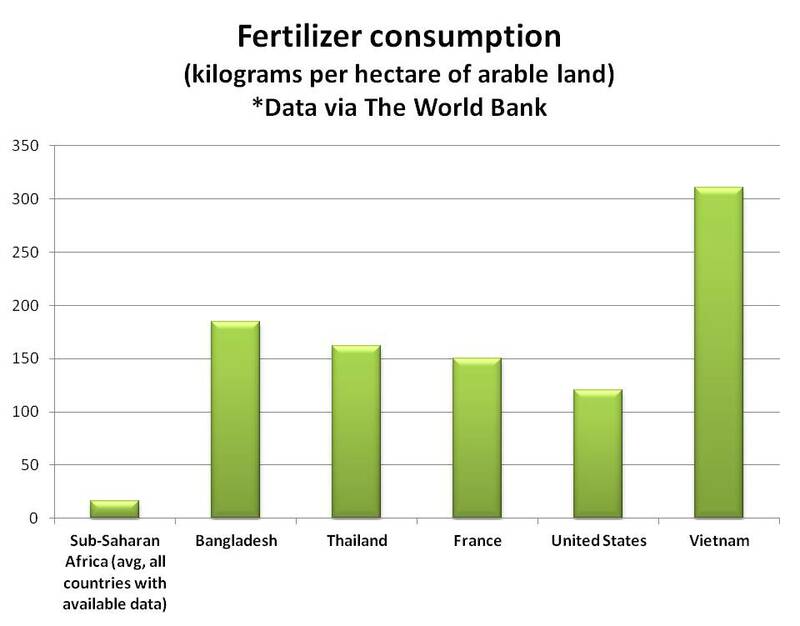 On average, sub-Saharan African countries use about 17kg of fertilizer per hectare of arable land; whereas countries like France and the US use around 150kg and 120kg, respectively (based on World Bank data). Bangladesh has a significantly smaller GDP per person than sub-Saharan Africa and yet it uses around 184kg per hectare. When you consider that sub-Saharan African countries have an average of 49% their land suitable for agriculture, there is enormous potential for increased production simply by boosting the use of fertilizers. Unfortunately, fertilizers conjure a similarly scary numbers game. Phosphate is non-renewable and not yet replicable as the key ingredient of fertilizer. Foreign Policy Magazine called it the “gravest natural resource shortage you’ve never heard of.” Estimates differ as to how quickly we are approaching ‘peak phosphorus production,’ the point where production of the mineral goes as high as it ever will. An armchair economist would see this as an obvious choke-point for an opportune supplier to impose high prices and supply restrictions that could wreak havoc on food costs and production. Morocco is certainly in that position, holding around 77% of global reserves. So then why isn’t the phosphate supply a cause celebre in food security? Why isn’t Morocco implored by the UN Security Council to increase production to alleviate food prices? The answer is; because they don’t have to. The September announcement by state-owned Moroccan Phosphate Company (OCP) of their plans to “nearly double phosphate output over the next five years, despite a fall in global prices” exemplifies their approach. At a “planned cost of 15 billion dollars,” the decision offers rather comforting evidence of Morocco’s commitment to responsibly manage its production of a vital global commodity. This approach is in stark contrast to the old OPEC model of restricting oil output to keep prices high. This doesn’t solve the problem of world hunger, of course. There is still debate about how best to increase food production in Africa, whether it be from fertilizer subsidies or otherwise. But Morocco’s management of phosphate rock production prevents further crisis and food insecurity at the expense of likely profit and power. Responsible resource management is as rare as it is underreported. So, in honor of World Food Day, praise should fall to Morocco for making sure that phosphate supply isn’t needlessly a cause for high prices and panic, as oil often is. Unlike Borlaug, Morocco probably won’t receive a Nobel Prize for this, but recognition is certainly worthwhile. Andrew Boyd, a researcher at the Moroccan American Center for Policy, assisted in writing this article.